An internationally recognized authority in zooarchaeology, Dr. Klippel’s research has covered prehistoric and historic sites in the Southeastern and Middle Atlantic regions of the US, the Caribbean, and in the Eastern Mediterranean. Dr. Klippel was the primary person overseeing training in the identification and analysis of animal remains within the department, using technical methods and equipment critical to modern research. Over the years, he has trained hundreds of our archaeological and biological anthropological students, including in forensics. 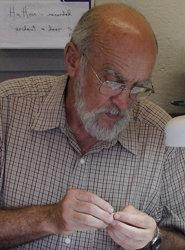 Working with the Forensic Anthropology Center, Dr. Klippel served on many graduate student committees and used the Anthropological Research Facility for many of his taphonomic experiments. In a lasting contribution to Forensic Anthropology, Dr. Klippel discovered that evidence for squirrel gnawing can be used to help estimate time since death, because squirrels do not gnaw on bones for at least a year after death. He also showed that raccoons, rats, squirrels and opossums all leave distinctive, recognizable signatures. Among his other contributions to the Anthropology Department, Dr. Klippel oversaw and expanded the extensive research collection of animal bones (first established by Paul Parmalee) now curated by the Anthropology Department and at the McClung Museum. The collection, which spans early prehistory to the twentieth century, enriches the training of UT students and attracts visiting researchers from around the country and internationally. The zooarchaeological materials in the Department of Anthropology, including over 11,000 skeletons in excellent condition, are regarded as one of the finest comparative research collections in Eastern North America, continually in use by students and outside researchers, and for TBI, FBI, and NCIS training in association with the Forensic Anthropology Center. 2009 (with Hulbert, R, S. Wallace, and P.W. Parmalee) Cranial Morphology and Systematics of an Exttraordinary Sample of the Late Neogene Dwarf Tapir, Tapirus polkensis (Olsen). Journal of Paleontology 83(2). 2007 (with Synstelien, J.A.) Rodents as taphonomic agents: bone gnawing by brown rats and gray squirrels. Journal of Forensic Sciences 52(4). 2007 (with Price, B.) Bone disc manufacturing debris from Newfoundland to Antigua during the Historic Period. In (Christian Gates and Renee Walker Eds.) Bones as Tools: Archaeological Studies of Bone Tool Manufacture, Use, and Classification. (Chapter 10) British Archaeological Reports, International Series 1622. 2004 (with Sichler, J.A.) North Atlantic fishes in inland context: pickled mackerel (Scomber scombrus) in the Historic Period. Historical Archaeology 38(38(4). 2003 (with Snyder, L.M.) From Lerna to Kastro: further thoughts on dogs as food in ancient Greece; perceptions, prejudices, and reinvestigations. In (E. Kotjabopoulou, Y. Hamilakis, P. Halstead, C. Gamble and P. Elfanti Eds.) Zooarchaeology in Greece: Recent Advances. London, UK: British School at Athens Studies 9. 2002 (with Falk, C.R.) Atlantic cod in the Missouri River: Gadus morhua from the Steamboat Bertrand. Archaeofauna 11. 2002 (with Parmalee, P.W., Meylan, P.A., & Holman, J.A.) A Late Miocene-Early Pliocene population of Trachemys (Testudines: Emydidae) from east Tennessee. Annals of Carnegie Museum 71(4). 2001 Sugar monoculture, bovid skeletal part frequency, and stable carbon isotopes: Interpreting enslaved African diet at Brimstone Hill, St. Kitts, West Indies. Journal of Archaeological Science 28. 2000 (with Snyder, L.M.) Dark Age subsistence in East Crete: Exploring subsistence change and continuity during the Late Bronze Age village of Kastro. In, Aspects of Paleodiet in the Aegean, edited by S. Vaughan and W. Coulson. Oxbow Press, London. 1999 (with Stafford, T.W., H.A. Semken, R.W. Graham, A. Markova, N. Smirnov, and J. Southon) First accelerator mass spectrometry 14C dates documenting contemporaneity of nonanalog species in late Pleistocene mammal communities. Geology 27(10). 1999 (with Snyder, L.M.) Harvest profiles, domestic ovicaprids, and Bronze Age Crete. In, The Practical Impact of Science on Aegean and Near Eastern Archaeology, edited by S. Pike and S. Gitin. Archetype, London. 1999 (with Schroedl, G.F.) African slave craftsmen and single-hole bone discs from Brimstone Hill, St. Kitts, West Indies. Post-Medieval Archaeology 33.